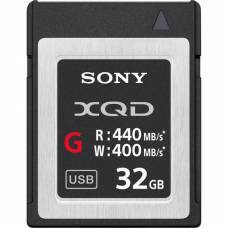 XQD cards appeal to sports, photojournalism and wildlife photographers as they are able to keep up with the shooting speed of your camera which, in turn, clears the bufferBUFFERInternal camera memory used to cue images for saving to the memory card. This cueing is necessary due to the inherent writing speed limit of memory cards. When the buffer becomes full, it creates a bottleneck and the shooting rate reduces dramatically to compensate for the memory card speed limit. More professional cameras typically have much larger buffers which can cue a larger amount of images before the shooting rate is reduced. faster. These features make them perfect for high-definition camcorders and high-resolution digital cameras. In essence, their key benefits are providing fast read and write speeds, and high-capacity storage. 400 MB/s write speeds make it easy to capture photos in both burst mode and in RAW format. Sony’s XQD memory cards are Shockproof, magnet proof, anti-static and resistant to breakage. Streamline workflow with 440 MB/s read & 400 MB/s write speeds. Use to record 4K video. Supports EB Streaming between card and Sony camcorders enabling constant 2-way communication. You can change your mind at any time by clicking the unsubscribe link in the footer of any email you receive from us, or by contacting us at inf[email protected] We will treat your information with respect. For more information about our privacy practices please visit our website. By clicking below, you agree that we may process your information in accordance with these terms.